A recorded message from Amina Mohammed, UN Special Adviser on Post-2015 Development Planning set the tone and theme for the two days. Ms Mohamed thanked the Government of South Africa for “showcasing its leadership and supporting the updated Global Strategy” —which she described as “an overarching framework and a common vision for women’s, children’s and Adolescents’ Health through to 2030”. She stressed the importance of high-level support , strong commitment and action from countries in this transition period from the MDGs to the SDGS, pointing out that although there have been gains in women’s, children’s and adolescents’ health, “they remain a core unfinished agenda of the MDGs” which “need to be prioritized, protected and accelerated “. Dr Matshidiso Rebecca Moeti, Regional Director for WHO’s Africa Region spoke of the importance of putting strategies and priorities into action and outlined how this approach has translated into tangible gains in the African region on MDGs 4 and 5-improving newborn and maternal health. She pointed to countries such as Liberia, Eritrea, Ethiopia, Malawi, Tanzania, Niger that have reached MDG 4 and Mauritius, Seychelles, Equatorial Guinea that have achieved MDG 5.These achievements she attributed to multisectoral collaboration, partnering, evidence and use of strong data to define policies and the “Triple tier approach – immediate, long term needs and adapting to change. 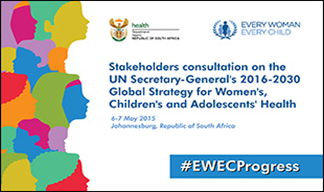 One of the more evident changes to the new updated Global Strategy is the strong emphasis on youth and adolescents. Gogontlejang Phaladi, AfriYAN Member, Botswana, representing the youth voice was on hand to make a strong case for the importance of youth participation and relevance to Post 2015 and the Global Strategy. She emphasised the importance of recognizing the demographic weight of young people since “youth are the best shot at having a better Africa”. “Any leader who does not prioritize youth participation is a bad leader”, she said. As part of the problem, she felt it was imperative that youth also be at the centre of the response. Ms Phaladi called for more investment in adolescent health, a systematic involvement of youth in discussions and a move from conversation to action. She ended her intervention with some strong advice saying “I leave you with four recommendations: ACTION, ACTION, ACTION, and ACTION”. Representing the South Africa National Department of Health, Aaron Motsoaledi, Minister of Health warmly welcomed participants to South Africa. He spoke briefly about South Africa’s successes and challenges in improving maternal, child and adolescent health with a roll out in 2009 of the HIV AIDS program to now with more than 3 million people on treatment, introduction of HPV vaccination in school health programs, revamped family planning programmes and the use of technology such as Mum connect cell phones to reach women when pregnant, which has had more than 280,000 women sign on. He underlined the importance of leadership in supporting the Global Strategy and gave some sobering insight into the state of affairs on the continent, pointing out that none of the health goals will be achieved if Africa does not achieve universal health coverage. He also reflected on the challenges the continent faces describing weak health systems, huge equity gaps and a lack of trust in the health system by even African leaders themselves. Change, he concluded was needed. The opening session will be followed by a series of group work and discussions leading into the second day. Key to these discussions will be the Zero Draft Global Strategy published yesterday and available to participants for input.